The liberal attack on religion stems from envy, greed, anger and hate, just like every other precept of liberalism. Liberals envy the loyalty and devotion that religion inspires. They hunger greedily to have it for themselves. Mostly, they are angry because the religious dare to defy them and to reject the ugly and inhuman tenets of collectivism. And they hate God for having the temerity to define right and wrong. They consider that their sole prerogative. 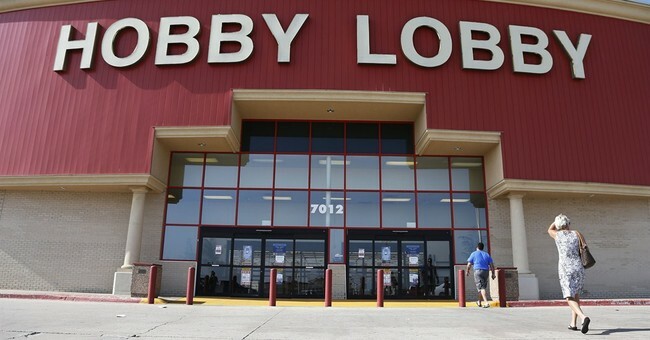 The liberal freak-out over the Hobby Lobby decision is just the latest example of the left coming out of the closet and embracing its anti-faith bigotry. It’s interesting to see how liberals approach the controversy, and how they fail to even accurately describe it. In the big picture, the Hobby Lobby case basically pitted the right of individuals to practice their religion even when they combine into closely-held corporations against a newly-minted pseudo-right of women to receive free birth control insurance coverage. Now, the right of religious liberty has been recognized for over two hundred years in the First Amendment. The pseudo-right of free birth control insurance coverage came into being when bureaucrats at the Department of Health and Human Services decided to mandate it following passage of Obamacare in 2010. Naturally, the liberals side with the government bureaucrats’ four year-old whim over the established principle of religious liberty. Of course, liberals won’t say that. Take Hillary Clinton. Please. Hillary was outraged by the ruling which, legally speaking, focused on the applicability of the federal Religious Freedom Restoration Act’s (RFRA) requirement that any infringement on religious liberty must serve a compelling governmental interest and consist of the least restrictive means to achieve it. RFRA is hardly part of any #WarOnWomen. It passed with overwhelming majorities in Congress. In fact, Ted Kenney was one of the driving forces behind RFRA – uh, that was probably a bad metaphor. And, of course, Bill Clinton signed it, making it yet another of the sexist, homophobic and otherwise awful laws Bill Clinton signed that Hillary now rejects. Hillary, of course, portrays the decision as some sort of violation of a woman’s constitutional rights while failing to mention where such a right to free stuff is hiding among the amendments. In doing so, she applies the same keen legal insight that led her to failing the D.C. bar exam. And there are creepier parallels. In ancient Carthage, they worshipped a god called Baal of the Fiery Furnace who demanded the sacrifice of young children. Today, salty feminist grad students play hooky from their classes on how patriarchy kept boys from liking them to shout slogans about how their abortions empowered them as womyn. Apparently, only the death of countless babies can atone for the cruel patriarchy of western civilization. Or something. Here’s a helpful hint, Matt. The end with the hole is the one that goes “bang.” That’s the end you’ll want to point at those religious people whose religion you want to stamp out. I know a bunch of people who would die to preserve their religion. I’m not sure Matt would be willing to die to stamp it out – or that he could find any other sucker willing to lose his life trying to fulfill that liberal fantasy. What Matt reveals is the not-so-hidden desire of the left to wipe out every competing power center in society, and religion is a competing power center. He, and his goosestepping brethren, hate the idea that people might hold and act upon beliefs other than those he and his pals cooked up at some D.C. cocktail party or in some faculty lounge at the local university’s Oppression Studies Department. This is why they must break religion to their will. Some, like the alleged Presbyterians who recently divested in Israel, are only too eager to obey by choosing leftism over God’s chosen people. But where they can’t stamp faith with their brand, they will seek to stamp it out. My new book,Conservative Insurgency, is a speculative history of the future struggle against the false religion of liberalism, and it anticipates that this war on those of faith will only get worse before it gets better. But then oppression is something the religious (and secular people who defend religious liberty) have faced throughout history. Yet today, the religious have tools they did not necessarily have in the past – first and foremost, a Constitution that protects our right to practice our religion as we see fit. Moreover, we also have social media that allows us to bypass the secular gatekeepers to spread information and organize. Oh, and we also have God on our side.